A tally of 27 points from Eddy Leginus wasn't enough to avoid defeat for Fury. Fury Men suffered a first loss of the season and only their third in all competitions in two seasons when they went down 93-80 to St Mirren. Despite a game high 27 points from Lithuanian point guard Eddy Leginus, Fury could not pull back the double-digit lead Saints side had gained by the third period. The teams traded baskets in the opening quarter and it was clear that this was going to be a tough road game for the Falkirk side, Leginus opening Fury’s scoring with two and three-point plays. Austrian Adam Hammerschmidt and Bryan Munnoch added the next nine as captain Keith Bunyan finished the period with back-to-back threes to trail the Saints at 22-20. Kornelius Dauksas retained his starting five spot and worked hard to keep Saints key forward Chris Cleary to three points in the first period, but in so doing picked up two fouls, forcing headcoach John Bunyan into some difficult match ups. That proved key in the second stanza when Cleary was able to go on a seven-point scoring run that saw Saints hold an eight-point half-time lead. Fury’s Bryan Munnoch was key to keeping Fury in the game with six personal in that period. The third was another basket for basket affair with neither side able to establish any kind of dominance. With a 24-22 scoreline to Saints in the third their lead was now 10 going into the final quarter and all to play for. Eight personal from Leginus in that period, and Bunyan and Dauksas sharing 10, were the big numbers for Fury. The final period saw Fury look at changes in their defence but two threes from Dale Grieve were pivotal in Fury having to chase the game in the final minutes. Leginus finished strongly for Fury with 11 personal in the fourth, a tally that included three threes. While the Sony sponsored side hit 11 threes in the match it paled in comparison to last season’s record 21 threes against the Saints side in the corresponding fixture and for the Saints team it was win on balance they deserved. While Leginus had 27 points, with Bunyan and Hammerschmidt sharing 28, the only other significant scorers for Fury were Munnoch on 12 and Dauksas on 7. Jenna Beattie led Fury’s senior women to their first win of the season with 21 points as they defeated West Lothian Wolves 67-53. Captain Jen McLaren added 15 with Laura Nimmo on 11. Fury pressed from the tip and found immediate success as they built up a double digit lead in the opening stanza. Wolves however fought back to bring the match to 25-18 going into the second period. The second saw Fury take the lead out to 14 at the half with Beattie, Mclaren and Nimmo the Falkirk side’s main scorers. The third saw Fury increase the lead and at the end of the period the gap was 17. Wolves continued to work hard but Fury were able to see out the game with several of their cadettes and juniors. Sony Centre Fury Junior Men lost out 73-67 in their Division 1 top of the table clash with St Mirren. Both teams went into the game undefeated at 5-0 for the season and produced a close encounter that saw Fury’s season top scorer Sardar Pandher forced to leave the game in the opening minutes with a serious eye injury. With the teams tied at the half on 33 apiece, Fury had recovered from a poor start that had seen them 16-8 down as they adjusted to Pander’s injury. A 25-17 second quarter saw the Falkirk side get the points onto the board that was in line with their season average of an incredible 30 points a quarter. The third period saw Saints take what turned out to be the difference - a 27-21 period and six-point lead - as the sides tied the final quarter. 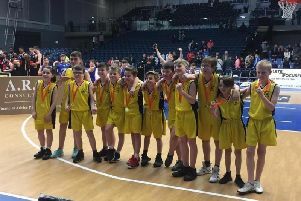 For Fury the six-point gap is a figure that they will feel capable of turning around in the return fixture in Grangemouth in what could be the key game for the top two sides in Scottish Junior basketball this season. Mitchell Stirling and James Kerr led Fury sharing 26pts with Kieran Allan stepping up with 11 and Daniel Olubalade on 10. Daniel Messenger with 26 and Daniel Dewar with 24 combined for 50pts as Fury JM2 beat West Edinburgh Warriors 85-21 and pushed into the top four of the league. Fury were too strong for the capital side and continue to develop as the season progresses. Liam Burrell added 15pts for the Falkirk side. The newly merged Knights-Fury Junior Woman side went down 75-60 to West Lothian Wolves. A strong opening period saw them lead by four points at the end of the opening period. However a poor second period where the team was often caught in transition saw them fall 12 behind at the half. While the third was even, the KFC side tried to reduce the gap in the final stanza with some pressing play but this meant some easy baskets for the opposition and a final 15pt difference. On the positive side the KFC team can take heart from the fact that despite lack of practice as a team the players worked for each other and several key players were unavailable. Top scorers were Katrina Kirsop with 21, Nina Wills on 13, Rachael Penman on 11, Molly Waddell on 10 and Mairi McGill on 5. It was a double win for St Mirren in the U16 National Championships Division 1 and 2 as both Fury sides lost on the road. The Cadet Men’s 1 team, who were without their season top scorer, Scotland international Jack Davidson, were behind 19-9 at the end of the first quarter and with a second period of 19-7, Saints were firmly in control. The second half was an improvement with 12-10 and 16-16 third and fourth periods. For Fury Jake Cavannagh was the standout with 17pts, with Cornelius Olubalade on 8. The Cadet Men 2 continue to look for their first win of the season but a poor opening quarter saw Saints lead 17-6. Fury struggled to stay in touch, but the Falkirk side worked hard and with the second and third quarters scoring 19-12 and 19-14 in the home team’s favour, Fury were competing well. However a final period saw Saints in control as they moved to an 84-40 win. For Fury Mark McGuire with 13 and Struan Henderson were the team’s top scorers. Fury Cadettes lost out in the final quarter as they went down 66-42 to St Mirren. A final period saw Fury drop out of a game they had led at the half and they were just two points behind going into the final stanza. The young Fury team just could not match the finish of the Saints side and when starting guard Eabha Kerr fouled out early on in the fourth, for the second time in 2 weeks Fury paid the penalty for not having key players on court at a crucial period. With Kerr’s U15 Scotland teammate Abby Rutter not available for the Kats-St.Mirren games and foul trouble affecting the team, a lot of court time has been seen by the hard working Rowan McConnell and Imogen Thom who have had to step up and play major minutes. Despite her foul trouble, Kerr led Fury with 13 points, Katie McEwan 12 with Rosie Wallace on 10.